into their hearts, making them more open and available to the world. When we start coming out of the jet lag haze I will write more and send along Keith's pictures as he edits the 9,000 or so he took. Plus Vanessa and Tasha competed with him sharing lenses and jockeying for position in the Land Rovers. Keep in touch. (This written as a journal in the middle of their safari) We landed in Nairobi and got immediately on our charter to Shompole. Had a quick breakfast and took short drive. We were told it would be unlikely to see game this late in the morning. But we found a lioness and drove within 5 ft of her—we felt so lucky! Noticed she was crouching and saw wildebeest and zebra in distance...decided to wait and see what she would do. The game got closer and closer...the lioness was quite still and crouched...and patient, we waited 45 minutes...once she was surrounded by game she struck so quickly we didn’t see her bolt! Mayhem ensued—dust, animals splashing...when dust settled we saw the wildebeest with the lioness at its throat. Unbelievable to see this kill! Later that night we went out for another drive and found the same lioness eating her kill with her 3 brand new babies. This was the first time the new cubs had ever been seen. Such a rare treat. Soon another lioness arrived with 4 older male cubs. We were told they will be powerful force one day—4 brothers!!! Then the male lion with his mane arrived. We are completely dumbfounded by our experience. 3 days spent at Shompole were incredible. We saw another very large lioness that was very preggers. Also giraffe, buffalo, so many things. A special night in the bush when we were surprised by Maasai from the local village singing and jumping and a blessing from the spiritual leader/medicine man. We asked him to bless our friend Jane. After spitting and speaking her name into his stones he declared that she will be well soon and gave us a blessing to bring home to her. Today we arrived at Ol Donyo Waus...the rooms are like Four Seasons. Private pool overlooking the watering hole where a large bull elephant entertained us during lunch. This afternoon a horseback ride to prepare for our 2 night overnight ride tomorrow. Maybe some rhino in our camp tomorrow night?? We are having the most amazing and incredible time. Our guide, James is a rare treat. You all must come here one day. Our socks are blown off!!! 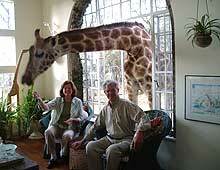 Quick question.... With your past clients...How long [after the safari] did it take them to feel somewhat normal? And by normal, I mean not unbelievably miserable and depressed that one is no longer there. Seriously, we had the most amazing time. Completely surpassed anything we could have ever dreamt of. You girls totally rigged it up. We can't wait for you to see the pics. So many memories... In Samburu, our guide Robert was a warrior and invited us to visit a local village where we were treated to tribal dancing and a personal market – our children will certainly never forget this experience as it was so different from their lives and a wonderful lesson for them all. 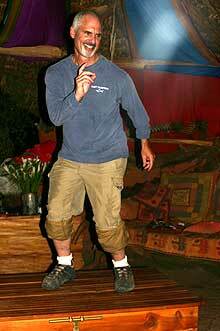 Harry still talks about the jungle toothbrushes and the spears Robert carried! And going on our first family safari with children aged 11, 9 and 7 years we decided to take our own personal guide with us and it was a very worthwhile decision. 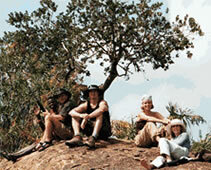 VirginBush’s guide Squack made the transitions to each camp seamless and stress free. Whilst out on safari his knowledge of animals and fauna was outstanding and ensured that there was never a dull moment for any of us. He was also invaluable in situations which were unnerving for children such as a herd of elephant surrounding the jeep – he advised us on how to behave, reassured the children and encouraged us to explore on foot as well as by jeep. We had many memorable experiences following lions hunting, watching elephants mate and seeing a rare aardvark, which I truly feel were improved by having Squack guide us. It never ceased to amaze me how he could spot a sleeping lion or a giraffe on the horizon long before any of us! We were made to feel so welcome in all the camps -- they are small and only cater to a few guests. It was like going to stay with family friends rather that going to a hotel. This was vital to our experience. Having been to Africa numerous times, when my wife and I decided it was time to take our six-year-old on his first safari, we looked no further than VirginBush. Everything was handled perfectly, especially the attention to detail ensuring our son's enjoyment and the richness of his experience. 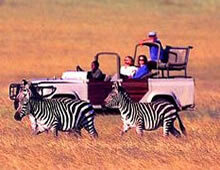 Cindi and Lisa get to know their clients and customize the safari perfectly. Their knowledge of East Africa and how to get things done is beyond compare. We are already planning our return. In a word, our trip was amazing. Every day was a new adventure and every day had a new, hilarious tale associated with it. We woke up every morning just waiting for that day to top the day before! Our families and friends hardly believe all the stories we managed to collect in such a short time! Thank you so much for planning such a wonderful trip. Kenya exceeded all of our expectations, and we hope to be back sometime very soon. WOW! You guys are unbelievable! We have had the time of our lives! We absolutely LOVED everything! We saw all of the animals except a rhino—including about 30 chimps. Ken and I were so proud of ourselves for getting up that STEEP Mountain, but it was so worth it—the chimps were laying around up there with their legs propped up against the trees! Every camp and experience exceeded our expectations. We made lots of great friends..including Manny and Jeffrey. The night the liboni blessed all 4 of us (thanks for including us!) and the evening with Lisa, Niklas and Sumaro were highlights. We loved all the camps, and as you both said, they all had their unique qualities. It was the trip of a lifetime for sure! We knew from the very start that we were in great hands. Thank you from the bottom of our hearts! Cindi and Lisa planned the trip of a lifetime for my family. Every detail was well thought out, and the lodging and the transportation were all perfect. The animals were fabulous, but it was the people that we met that made the [experience]. My sons tried to learn a little Swahili and a tribal language, and the people we met seemed very pleased by my boys’ efforts and took them under their wings. Even though my sons never met Lisa or Cindi, they said at the end of the trip that the girls “rock”! It was amazing trip! We thought China 18 years ago and scuba diving all over the world were the best, but this tops all of them. Everything Cindi and Lisa organized went just like clockwork. Not one glitch!! When I was planning this trip I worried about my daughter and I traveling without a main guide but found that every detail had been taken care of by Lisa and Cindi; the guides were excellent at each stop, so it I needn’t have worried. It was a spectacular 3 week adventure with fabulous animals, guides, sites and people. I had a hard time sleeping at night because I couldn’t wait for the new adventures the next day! I am 61 years young and this was something that I had wanted to do for 40 years; the safari was my dream come true and MORE. I can't wait to travel with VirginBush again in the near future. Kenya without a doubt is so much more than I could have possibly ever imagined. I fell in love with a country, its people and its way of life. What made all of that possible was the graciousness with which VirginBush introduced Logan and me to their friends in the safari and tribal communities. I will be forever grateful to you two for making a dream come true for Logan and for introducing me to such a wonderful, adventurous and beautiful country. Our accommodations were spectacular. 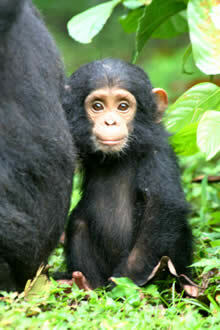 I continue to tell everyone that they must travel to East Africa, and that the only way to go is with VirginBush. As you know, I have been on two trips with you already and it will be my intention to come back many times more in the future. There simply is no way to describe East Africa. It is one of those places that has to been seen and experienced. For us the trip was life altering. Mark Twain once wrote �I have found out there ain�t no surer way to find out whether you like people or hate them than to travel with them�. Put us in the column of people who love Cindi & Lisa. Months before our trip we sat down and told them exactly what we wanted to do and they delivered well beyond our expectations. We were only 3 days into our 3 week trip when I turned to Cindi and joked with her that she might want to hold back a little something because it was going to be hard to outshine what we had already experienced, she told me not to worry. Every day was better than the next. The land, the people, and the wildlife of Africa are incredible and you can experience it in many different ways but do yourself a favor and do it with VirginBush. The trip our family and friend had earlier this year was simply fantastic. Although we had been to Africa before, what made this trip special was that Cindi and Lisa had the following abilities: 1. they listened to what we wanted out of the experience; 2. they had imagination as to what was possible 3. they had the contacts to ensure the best possible experience and 4. They are fantastic, knowlegeable and fun. 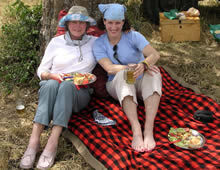 The best example was an experience I had in Arusha, Tanzania, where we spent one night in-transit. As we taxied in to the airport, I noticed a sign on the main building saying "Arusha- The Geneva of Africa". I asked Lisa what that referred to and she explained that the United Nations Security Council had established the Rwuandan Genocide trials in Arusha. I casually asked if it was possible for us to attend the trials. Without hesitation, Lisa got on her cell phone and in an hour I was sitting in a heavily secured room, wearing translation headphones, listening to and watching the entire proceedings. That and other memorable moments will be remembered forever. “Dear Virgin Bush Babes! A big thank you for being the professionals that you are. You handle every detail with such flair. My friend in Namibia is already coveting my VirginBush safari bag. The lodges and the experiences you recommended were the perfect fit for me. How you got the cheetah to show themselves every day in the Chyulus I will never understand. The up-close and personal encounters with elephant, watching the pride of female lion chase off the males, watching the wildebeest crossing and the crocodile attack, the sunset over Kilimanjaro, I could go on. And all of this within 2 weeks. It has been such a pleasure to get to know you both and to finally see you in action setting up my safari. Beautifully done. " “Edging breathtakingly close to elephants & giraffes; striding through the Mara with gazelles scampering before us; huddling with our Samburu guide, Alex, in the warrior room at Kiltamani; tracking freshly made footprints of cheetah and crocs; sundowning with a playful pride of lions pre-hunt; giving a cranky hippo the slip; yogaing at dawn and Samburu dancing at dusk; hurling spears with our Masai guide, Jonathan; dining elegantly out in the bush with flamingo-filled Lake Natron before us, sounds of Masai chants echoing; bucket-showering under a star-filled Tanzanian sky, and, of course, eating amazing food, always. Thank you for these unforgettable experiences and for such a smoothly choreographed vacation." “ It is Tuesday, and we are finally about recovered, physically at least. This has been one of the hardest emotional reentries that I can remember. Of course it was raining Sunday and Monday, and I got a parking ticket, and there are no Tusker/Tangawizi shandys to be had. We are all part of the same mutual admiration society, because we loved hanging out with you, Cindi, and definitely miss discovering and laughing with you every day. This was the best family vacation and experience we have ever had. We are already thinking about how we can incorporate Africa into our lives..."
We would recommend you in a heartbeat! Our safari was wonderful! Even without you two along to guide and host us, my mom and I felt very well taken care of on every leg of our trip. It really was an outstanding and very special adventure. Thank you both for all of your hard work, planning, organizing, arranging, input, advice and thoughtful touches. All those elements helped to make it a most amazing and memorable trip for us. And we're very grateful. Enjoy the rest of your busy season and, of course, the fabulous Migration. We have all been going through Lisa-withdrawal since we left. Our experience with you in the bush was beyond words. I know it has left a beauty mark on each of us! The depth of our experience has left me changed. I hear the kids tell our friends about their experience—expressing their amazement and awe—and yet we know that no one can really understand. I don't even attempt to tell most people how I felt during those weeks. I can tell you though how much we all appreciated the opportunity to be in there with with you and James and Samoro and Gabriel. Please keep in touch with us; we all feel connected to you and your journey. Thank you for making each of us feel welcome and giving us an experience we will never forget. 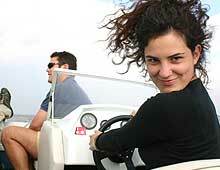 We want to express our sincere thanks to you both for the wonderful trip you planned and so expertly executed for us. Each camp was so unique and beautiful that every place we stay in from now on will suffer greatly by comparison. It was an incredible experience. Thank you for everything, including letting us hang out at your cottage at the end. That was above and beyond. Lisa, thanks to you, I woke up every day not knowing what wonderful things were in store and only you could make the New York jungle seem boring.! Thank you so much for making me feel alive again. Life is good. P.S. I miss the warties. Silly little Piggies. Give them my love. I cannot express in words what a wonderful experience we had [again with you] in Africa. I am trying so hard to express what it feels like to be on African soil to my friends who have not been there....and once again I am speechless (if you can believe it?). Early this morning I woke up in a fog and thought I was out in the bush. I thought I heard elephants, and all the exotic bird sounds that have been waking me up these past few weeks. I only hope that the experience lingers on for a long while!! As you can see I am back to emailing, phone calls, laundry, etc....and all the while I am sure I will be "dreaming of Africa." We send you the warmest thanks....and tons of love and hugs!!! Can't wait to see you again. Together with the photos, journals and our memories, we will enjoy many many moments of reflection. Funny how a trip like this unfolds—organically in some ways. I’ve been having dreams every night since we’ve been back about various animals—mostly elephants, and being in camps at night! There is so much more to say, but I mostly want to say thank you for generating an unforgettable experience for us! We couldn't have imagined a smoother trip or one that was more fun! In some aspects the experiences fell into the category of what we know we don't know! Always wonderful learning and being with such learners and teachers. We miss you both and we hope that you seriously consider coming to visit when you are in the States. Asante sana! 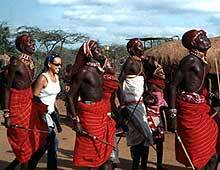 Though our feet are back on the busy streets of L.A. our minds have not left Kenya . We miss you both very much and all the glorious beauty that surrounds you. I think our friends and family are about to stick a sock in our mouth if we tell them one more fabulous story, always dropping very smart terms like the Alfa-male, the gestation period the matriarch and Martin is sure to correct one who god forbid would refer to the chimpanzee as a monkey! We will continue to share our wonderful time in Kenya with many, whatever it takes to keep us connected for that much longer. We are forever grateful to you both for making our experience such a memorable one. As the glow we exude when speaking of our time with you fades I hope it is not before our return. All I can say is thank you from the bottom of our hearts! Our trip was a life-changing event, made perfect by the preparation and attention to every detail of both Cindi and Lisa. We saw the majesty of the animals and terrain from a variety of venues, from posh lodges to 1920s-style camps. A trip to be savored, like fine wine, and we intend to renew our memories as we return again and again. I don't think our safari could ever be duplicated. The people, places and things--we saw, met and did---were hilarious as well as memorable. You two really pulled it off big time. What can we say about our trip? There just aren't any words that fully describe all that we saw and felt. We are so very grateful to have met you both. But, I believe that this was meant to be; there are no accidents. 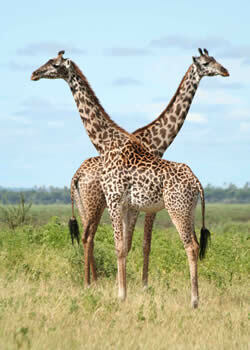 Africa is a very seductive place and we can't wait to see more! We miss you and thanks for showing us the most beautiful place that we have ever seen!! This was a life altering trip for all of us. 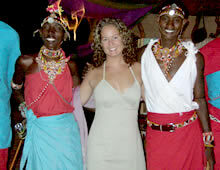 We have such fond memories of our wedding in Shompole, Kenya. When we think back to this wedding safari, we would love to do it all over again! Not only did Lisa and Cindi marvellously take care of a large group of guests from all over the world, but they also organised a wedding that was magical, beautiful and unforgettable! It was an amazing way to get married, and to share it with family and friends. Shompole was by far the most beautiful and special place that we have ever stayed in, and the safari in the Masai Mara exceeded all expectations in terms of the game viewing experience. We would recommend this to anyone wanting to do something special and unforgettable for their wedding. Thanks again Lisa and Cindi for your meticulous planning and organisation, and for your helpfulness and warmth. "I was pretty shaken up when I lost my Green Phantom decoder ring. I was crushed when Mr. Bear popped an eye and the dog ate it. I could barely recover why my sister painted pink hair and eye shadow onto my GI-Joe. 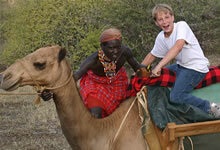 But I had no idea what real pain was until I started missing my old safari guides (whoops, did I say old?). Africa seems like a lifetime away...."
"As I look out the window at a light dusting of snow on this 28-degree day, I find it hard to believe that just 17 short days ago I was sunning myself on the shores of Lake Victoria. 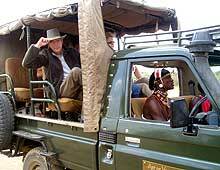 It would be truly difficult to improve on [our safari] experience; the trip was fantastic. Great people, great places, great animals, great scenery." �Scott & I can't stop talking about our trip�it was truly a life-changing experience and we owe it all to you!! Thank you for organizing such a perfect safari for our family and being so patient with your fantastic teaching. We are having a hard time even finding the words to describe it. Since we are having such a hard time with re-entry, we're just pretending all the cabs are zebras and beasties!